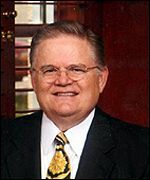 Pastor John Hagee is the founder and Senior Pastor of Cornerstone Church in San Antonio, Texas, a nondenominational, evangelical church with more than 19,000 active members. He is also the founder of John Hagee Ministries which broadcast the Gospel in America and over 200 countries around the globe through radio and television. After actively supporting Israel and the Jewish people for more than 28 years, Pastor Hagee recently established Christians United for Israel, which provides a national association through which every pro—Israel church, para-church organization, ministry or individual in America can speak and act with one voice in support of Israel in matters related to biblical issues. Over 146,000 members are currently part of Christians United for Israel. He has authored 25 major books ranging in topics from prophecy, marriage, family, biblical business principles and Israel. His most current writings are Financial Armageddon and Life's Challenges-Your Opportunities published by Strang Publications. Pastor Hagee and his wife Diana have five married children and eight grandchildren. Make a Free Website with Yola.